A few concepts that will help stock market traders. The stock price of Boeing will soon take off like the cruise liner from the runway. The company has received confirmation of a new order worth $ 339.6 million, for the construction of another 777-300ER aircraft for Swiss airlines. Such good news give a good chance of further growth of the company. Given that the current price on the New York Stock Exchange is at the upper boundary of the level of resistance and there is no any gobacks, meteoric rise is already at the start. 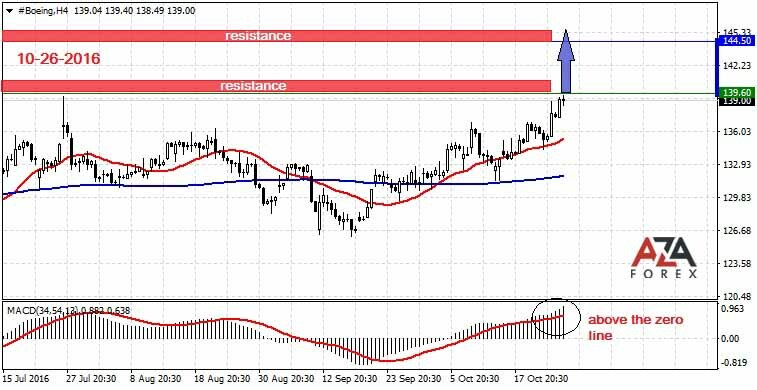 The nearest resistance level, which could stop the dizzying flight shares, and where traders and investors will be able to make a stop to get off the ground with the profit is 500 points away. Not every share can provide such profitable flying of the quotes. Usually, the travel range is much lower, and, respectively, the profit, that can be squeezed from the stock market with the same risks. So, dear traders, welcome aboard and enjoy your flight!